It helps to have a full stomach when you take it Garlic Oil 1500 mg by NOW! Despite taking Garlic Oil by NOW with food, I still sometimes get garlic burps. Aside from that no complaints. I've been on and off Garlic Oil by NOW pills over many years but since the price was reduced, I've started on it again. 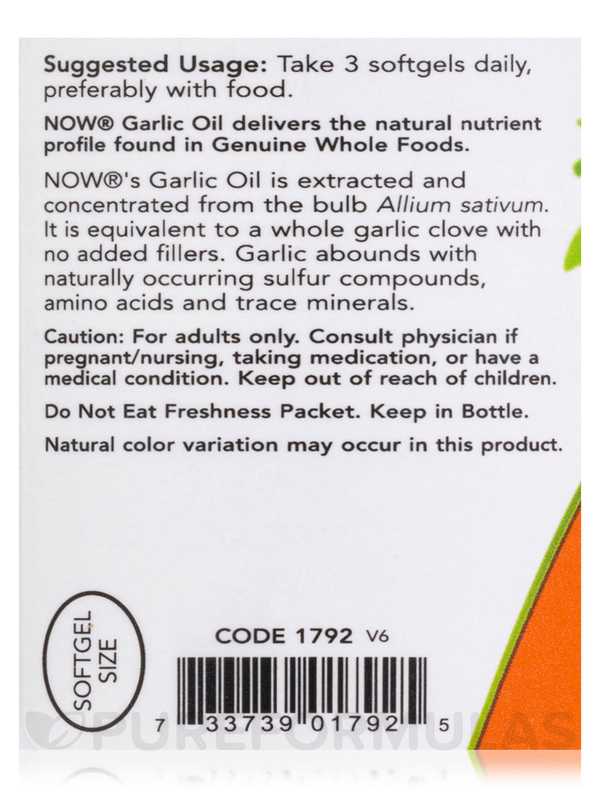 Maintain cardiovascular health with Garlic Oil from NOW® Foods. Garlic is an herb known for its pungent flavor. It has been used as a popular condiment in culinary preparations for generations. Over the years‚ garlic’s potential as a homeopathic remedy has been widely acknowledged. 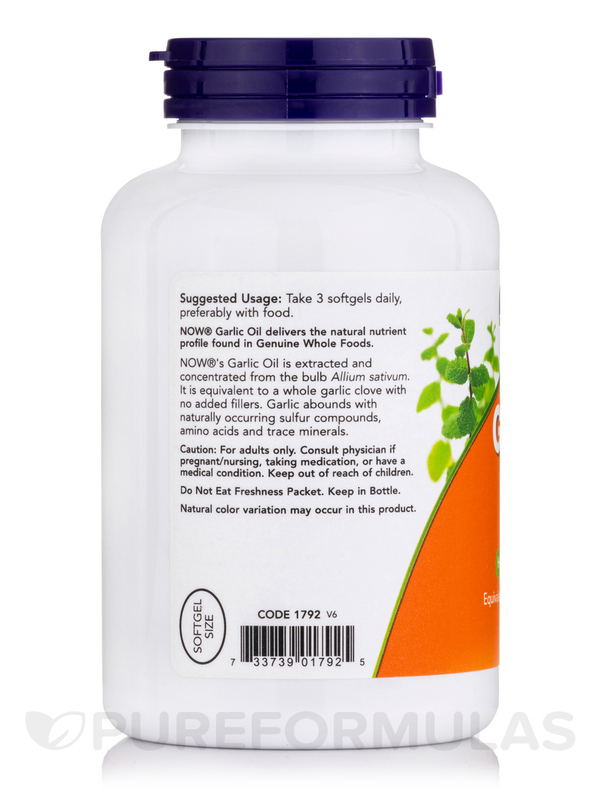 It may assist in the maintenance of cardiovascular and arterial health. Garlic may also help build a strong immune system too. It's also effective in reducing mild fever‚ cough‚ and sinus congestion. Garlic oil helps you overcome fatigue and promotes healthy liver function. The chemical allicin in garlic makes it well-suited for tackling a number of conditions. It is this chemical that is responsible for its pungent smell. The antioxidants in this oil from NOW® Foods help prevent oxidative damage. 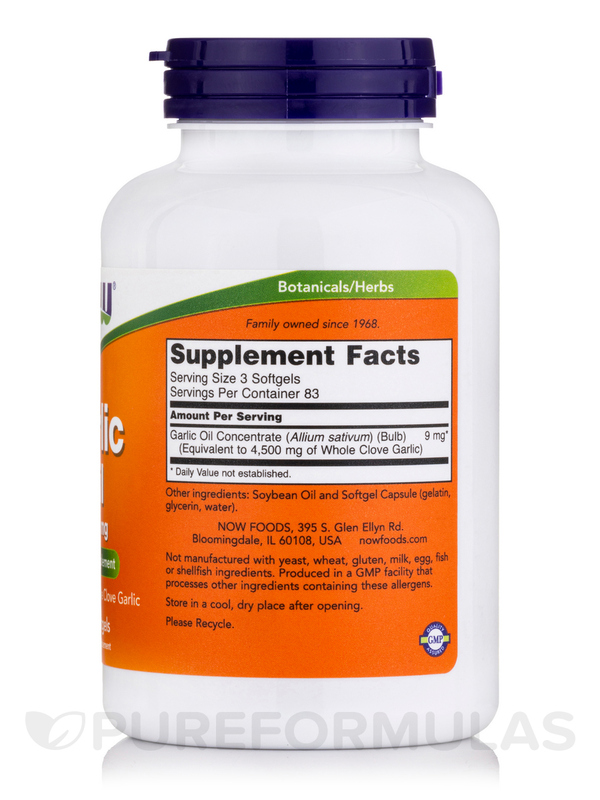 Boost longevity‚ athletic performance and chelate heavy metals from your body with Garlic Oil from NOW® Foods. It helps my inflamed small intestine feel so much better. I think it is working like a mild antibiotic. My gastritis in my stomach sure doesn't like it. All is well if I have a full stomach. 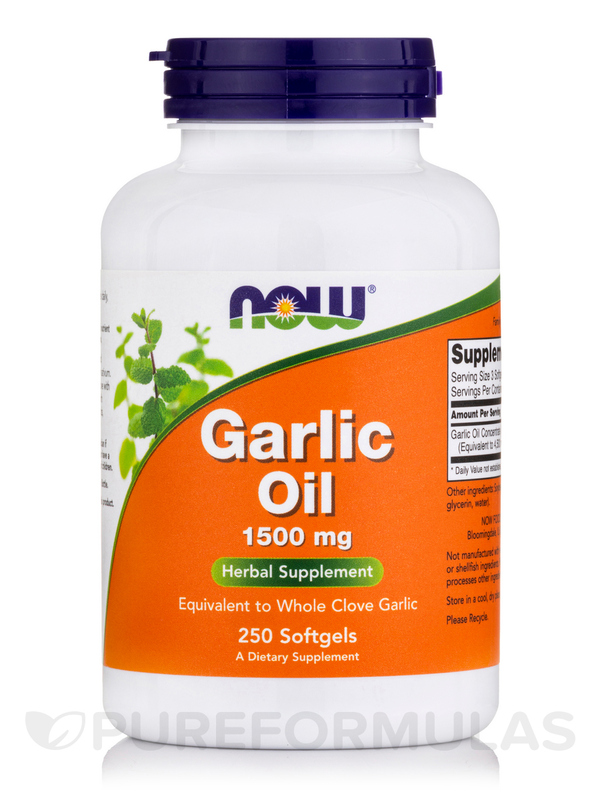 Garlic Oil 1500 mg by NOW is a great product, with a great price! Garlic Oil works for me! It has no strong garlic smell even while I've taken it. The pill is a lot easier to take than the glove of garlic. I took garlic to replace pills which is bad stuff. NOW is a good product. I bought Garlic Oil by NOW for my heart health. It is good cause I can take it every morning instead of taking pills with meals cause I forget. I have proof that NOW Foods Garlic Oil really works at thinning your blood. I had a surgery done while I was awake - lots of blood - and the nurses asked if I take aspirin to thin my blood - I said "NO" - but I had been taking this garlic for at least 8 years steady - It's the only thing I can think of that is responsible for my nice thin quality blood - the nurses said it was very nice blood! I like the price and quality - you can also use it in soups ect. Nothing - as a matter of fact of all the supplements I take - this one would be the last one that I would get rid of. 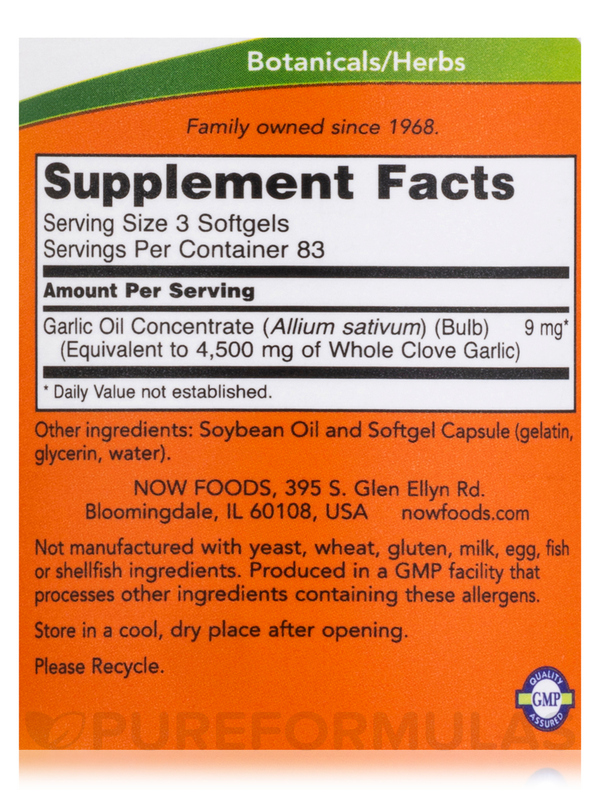 NOW Foods Garlic Oil has helped reduce my cholesterol I'm at 180, it helped with my blood sugar, I have type 2. My skin is clearer, I have stomach issues and they seem better. I order this product and received free shipping, the product arrived within 3 days, which is fantastic. It actually helps reduce high blood pressure, reduces blood sugar levels, great for your skin. Helps with stomach issues. It does smell like garlic, but I like garlic so that is not an issue. I've tried a number of different brands for garlic oil. The NOW brand seems to be the best option for quality and price. The softgels go down easy. I would definitely recommend this item. This form is more effective than the tablet form. Aside from the health benefits I was taking it for, it actually works as a great insect repellant too. Smells strongly of garlic, but does not cause you to smell like garlic. I love these Garlic Oil caps they have really helped my gastric issues and my skin. They do have a garlic after taste but i happen to love garlic so that doesnt bother me.